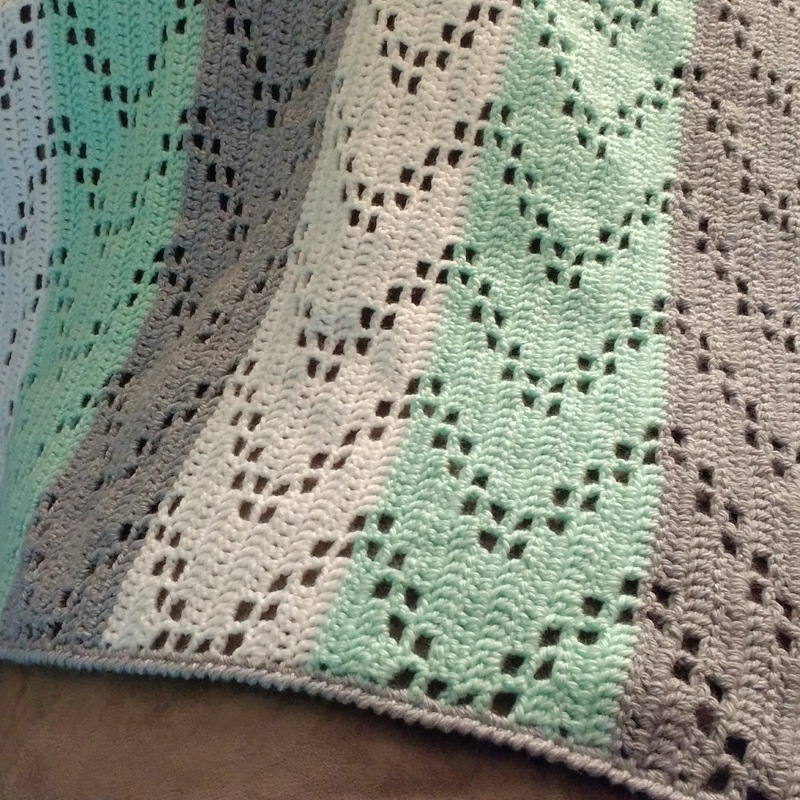 Austere Twist: Zig Zag Crochet Baby Blanket - Free Pattern! 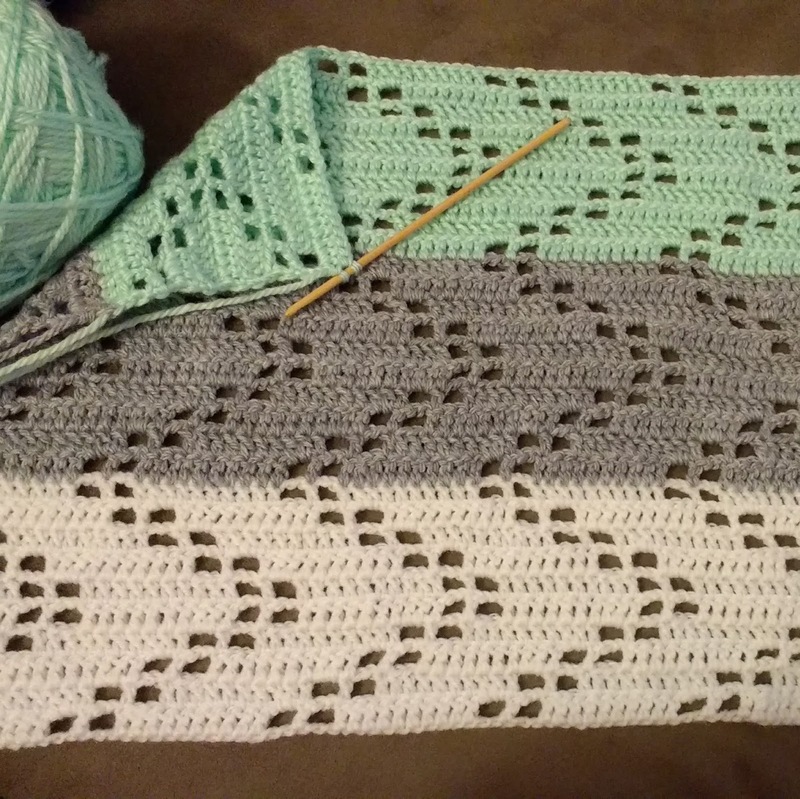 Zig Zag Crochet Baby Blanket - Free Pattern! 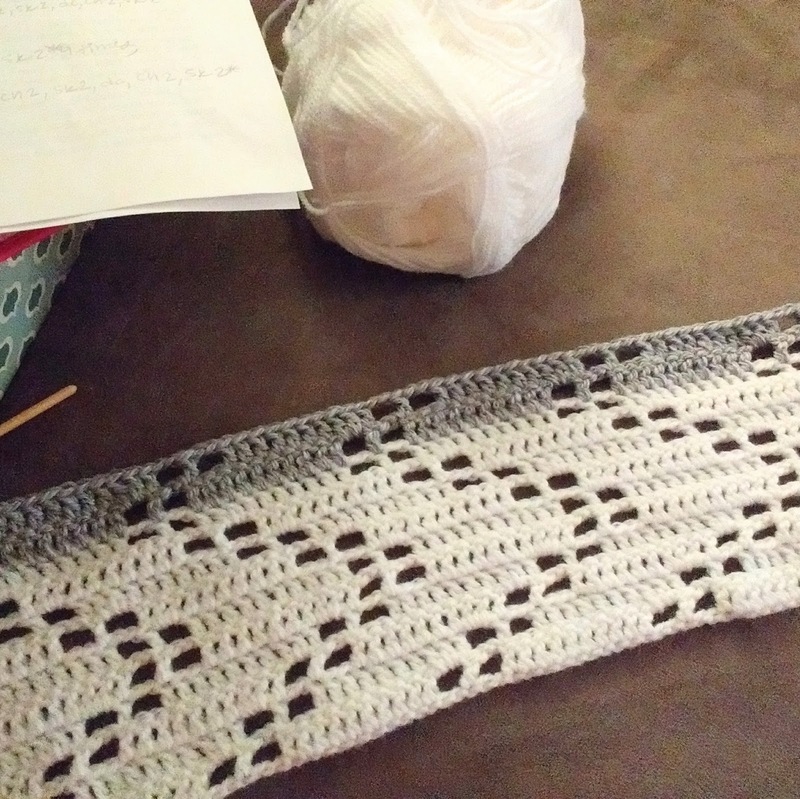 Have you ever wanted to learn filet crochet but find the way the patterns are written to be confusing? Now is your chance to try! I found the most adorable baby blanket pattern on Pinterest one night and ran out immediately to buy yarn. The Hopscotch Crochet BabyBlanket pattern by Little Things Blogged was exactly what I wanted to make for June 2017 baby. Light and airy but also visually appealing. I found the pattern hard to read so I rewrote it with counts instead of the traditional filet crochet language. 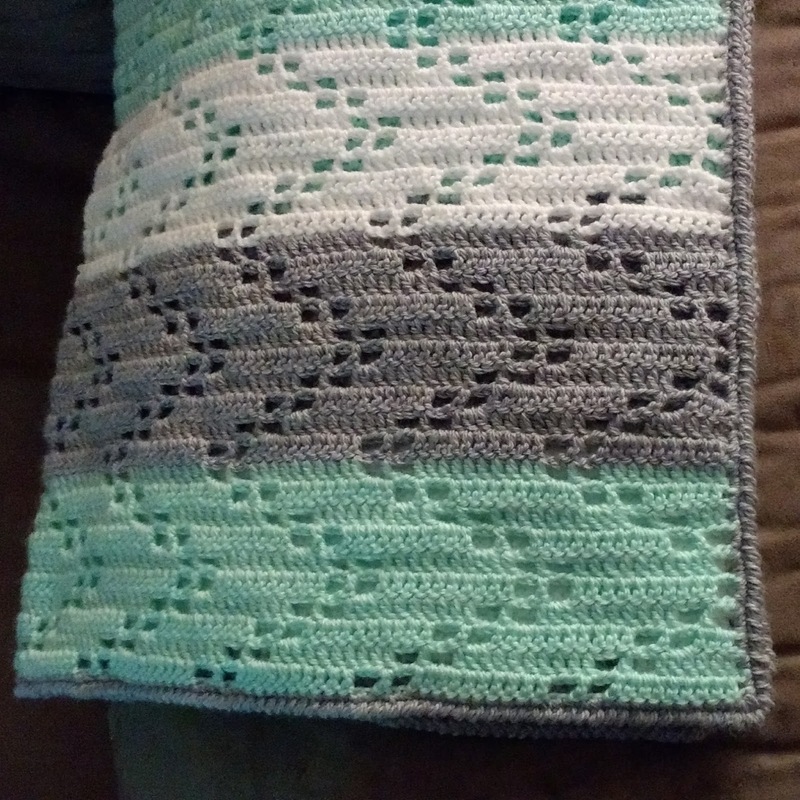 Feel free to make this gorgeous blanket in any color scheme, I'd love to see your creations! Row 1 (first repeat ONLY): Dc in 4th ch from hook (skipped ch 3 counts as dc), 8 dc, ch 2, sk 2, dc, ch 2, sk 2, *10 dc, ch 2, sk 2, dc, ch 2, sk 2* 8 times. 10 dc, ch 2, turn. Row 1 (all other 1-10 repeats): 9 dc, ch 2, sk 2, dc, ch 2, sk 2, *10 dc, ch 2, sk 2, dc, ch 2, sk 2* 8 times, 10 dc (last dc in ch 2 of turning ch), ch 2, turn. Row 2: (Ch 2 counts as dc) 6 dc, ch 2, sk 2, dc, ch 2, sk 2, *10 dc, ch 2, sk 2, dc, ch 2, sk 2* 8 times. 10 dc, ch 2, sk 2, dc. Ch 2, turn. Row 3: Ch 2, sk 2, dc, ch 2, sk 2, *10 dc, ch 2, sk 2, dc, ch 2, sk 2* 9 times, 4 dc. Ch 2, turn. Row 4: Ch 2, sk 2, dc, ch 2, *10 dc, ch 2, sk 2, dc, ch 2, sk 2* 9 times, 4 dc (last dc worked into ch 2 of turning ch). Ch 2, turn. Row 5: 6 dc, ch 2, sk 2, dc, ch 2, sk 2, *10 dc, ch 2, sk 2, dc, ch 2, sk 2* 8 times, 10 dc, ch 2, dc (worked into ch 2 of turning ch). Ch 2, turn. Row 6: Ch 2, sk 2, 9dc, ch 2, sk 2, dc, ch 2, sk 2 *10 dc, ch 2, sk 2, dc, ch 2, sk 2* 8 times, 7 dc (last dc worked into ch 2 of turning ch). Ch 2, turn. Row 7: 3 dc, ch 2, sk 2, dc, ch 2, sk 2, *10 dc, ch 2, sk 2, dc, ch 2, sk 2* 9 times. Dc (in ch 2 of turning ch), ch 2, turn. Row 8: 3 dc, ch 2, sk 2, dc, ch2, sk 2 *10 dc, ch 2, sk 2, dc, ch 2, sk 2* 9 times. Dc (in ch 2 of turning ch), ch 2, turn. Row 9: Ch 2, sk 2, *10 dc, ch 2, sk 2, dc, ch 2, sk 2* 9 times, 7 dc (last dc worked into ch 2 of turning ch). Ch 2, turn. Row 10: 9 dc, ch 2, sk 2, dc, ch 2, sk 2 *10 dc, ch 2, sk 2, dc, ch 2, sk 2* 8 times, 10 dc (last dc worked into ch 2 of turning ch). Ch 2 turn. Repeat Rows 1-10 switching colors every 10 rows until your blanket is the size you want. 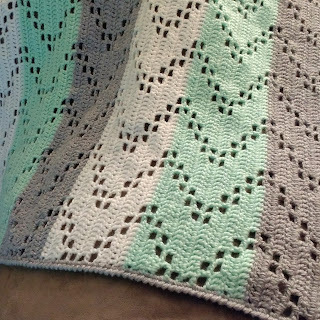 I did three repeats of White, Flannel, Mint. *Omit the "Ch 2, turn" in your last row of the blanket, fasten off and weave in ends. Row 1: With Flannel, sc evenly around the entire edge of your blanket putting 3 sc in each corner, sl st to beginning sc. Row 2: Ch 1, reverse single crochet around, sl st to first rsc. Fasten off, weave in ends. Your finished blanket should measure 33.5 inches tall by 28.5 inches wide. Thank You Little Things Blogged for the beautiful pattern! For a printer friendly version of this pattern click the link below. Thank you for the rewrite - I didn't understand the crochet language for the other pattern. Row 1 appears wrong. It ends on a ch 2, sk 2. I have a question about that too! row 1 ends with 2sk and 1dc but row 2 starts with 6 dc. that means the clusters will not overlap. Thanks for looking into it! I love the look of your blankets with these color choices! Row 1 (for the first repeat) should be: Dc in 4th ch from hook (skipped ch 3 counts as dc), 8 dc, ch 2, sk 2, dc, ch 2, sk 2, *10 dc, ch 2, sk 2, dc, ch 2, sk 2* 8 times. 10 dc, ch 2, turn. and then all other repeats of Row 1 should be: 9 dc, ch 2, sk 2, dc, ch 2, sk 2, *10 dc, ch 2, sk 2, dc, ch 2, sk 2* 8 times, 10 dc (last dc in ch 2 of turning ch), ch 2, turn. I'm somehow confused... I just started a blanket and completed Row 1 and Row 1 and moved onto Row 2... but my ch2, sk2 (etc.) are not lining up properly... am I missing something? Thank you for the rewrite!! I am an experienced crocheter but could not get the original pattern to work for me. I can't wait to try this! Do you know the multiples? I would like to change the size. I don't, the zig zags overlap so you would have to decide where you want the count to end. 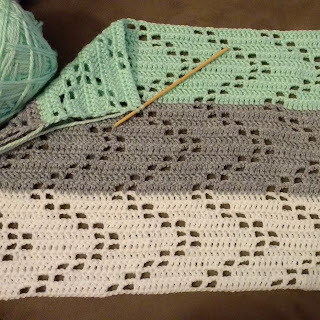 I just spend way longer than I care to admit figuring this out because the yarn and hook I'm using are larger, but I still want it to end up the right size for a baby blanket. I'm fairly certain this pattern is a multiple of 16+3. I would also like. To know the multiples, please. I could be wrong but I think the * should be before the last dc in the first row and the end should read 9dc, ch2, turn. I'm having problems with row 8, ch 2, sk 2, ch 2. Is a dc missing? Yes, there was a dc missing. Thank you for catching that! Row 8 should read: Row 8: 3 dc, ch 2, sk 2, dc, ch2, sk 2 *10 dc, ch 2, sk 2, dc, ch 2, sk 2* 9 times. Dc (in ch 2 of turning ch), ch 2, turn. For the beginning of row 1, should it look like 9 double chains? or 10? I just want to make sure I am understanding the pattern correctly before I start. So I chain 147 then do Row 1 (the one that says first repeat only). Then I do Row 1 (the one that says all other 1-10 repeats), then Rows 2-10. After finishing Row 10, I go back and start again at the Row 1 that says All other 1-10 repeats. Is that correct? Thank you. It doesn't work up right doing both Row 1's to start then row 2. Row 1 (all other 1-10 repeats) is worked the first time after row 10.
there are 9dc at the very beginning and end of the row. between all other squares, its 10dc. Do the instructions include the updates from all the comments made in the blog? Am I being really silly? Row 2 the holes in the pattern don't match up with row 1a and 1 at all. Where am I going wrong? How many times do we repeat row 1 (first repeat only). After i complete the row the first time. Just to make sure i am doing it right. I am a little embarrassed to say how confused I was at first reading this. The repeating ROW 1 is technically ROW 11 and repeat rows 2-11. I think if the pattern was written like that it would have clicked in my head. Duh haha. I felt so dumb after I got it. 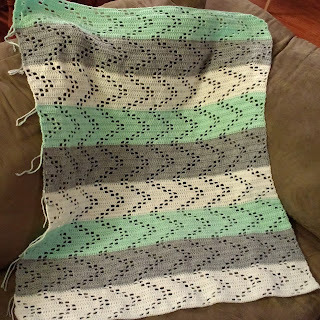 But also I wanted to say that in order to make this blanket larger or smaller it is worked in multiples of 15 + 12. If I want to make wider how many ch do I need to add to keep pattern? I think 15 but want to double check. Super cute. How can I add this to either Pinterest or ravelry? How would I make this larger width wise? For row 2, you say "Row 2: (Ch 2 counts as dc) 6 dc...." - so does this mean that after I do the Ch2, I only need to do 5 additional dc b/c the Ch2 counts as the first dc? I gotta say after the first or second row I got really confused by your instructions. However since I have been crocheting for years I was able to look at the photo and count stitches. Very simple pattern! If you can count stitches then you can do this pattern for sure! So every one the first row one is only to be used on the first line. After the first color you then never use that row again and you only use the second row one 😉 good luck everyone! Hi, I think in row 6, the first dc count should be 10 (not 9). am I missing something? I feel like in between (ch2 *10dc) there should be another sk2? 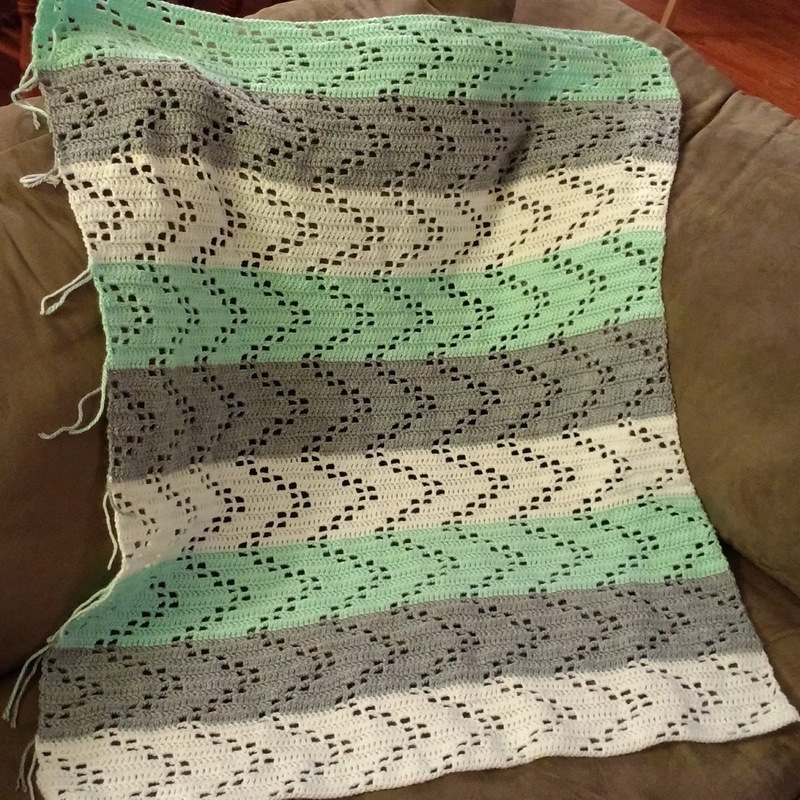 What’s the chain count for this gorgeous blanket? I’m just curious how many stitches I need to increase the chain to make it a little bigger. 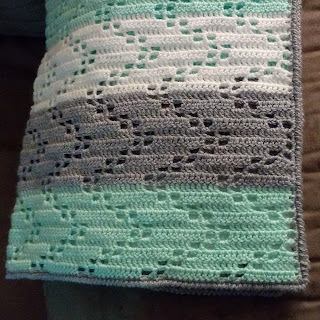 While I love the colors of this baby blanket I was wondering if it could be made in one color and in different dimensions (i.e. : 50"x60")? 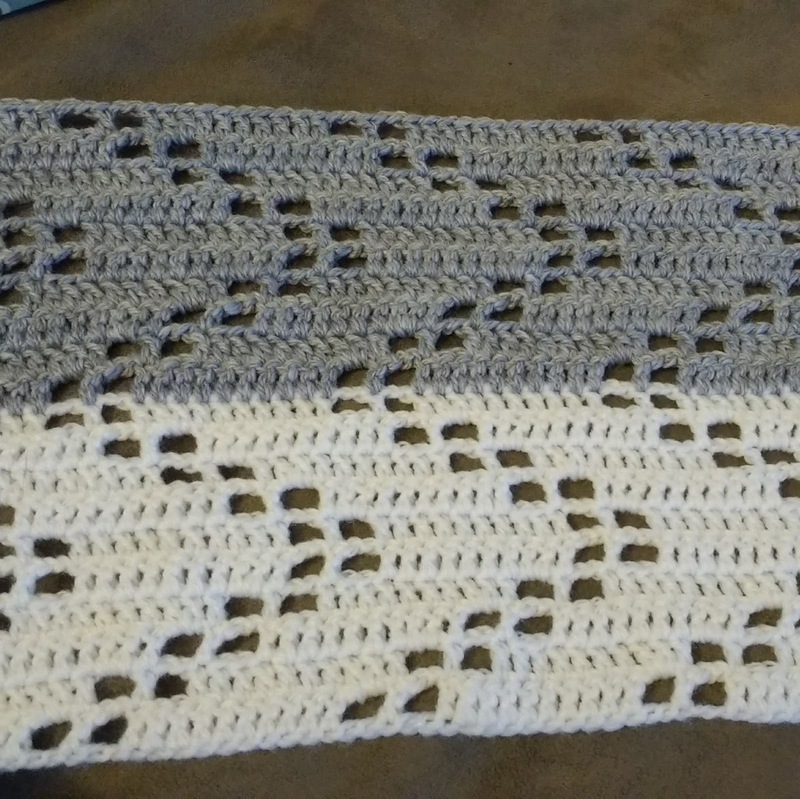 I am new to crocheting, so please have mercy on my questions. Hi! I just started this blanket and got to row 2 and noticed I had 11 stitches at the end of the row instead of 10. Do the ch 2’s at the end of every row count as the first dc for the next? So that ch 2 at the end of row 1 equals the 1st dc for row 2, then I do 5 additional dc’s for a total of 6? The pattern is a tad confusing but I think I’m figuring it out! I answered my own question!!!! To annoyed with this pattern. I just does not make sense. Or maybe I just cant read it right.5 hours in and I'm taking it all out. This pattern takes a second to figure out. I just finished a blanket and it turned out beautifully! Hope this helps, this pattern is worth it on the end! A weighted blanket was shown to help people experiencing from assorted kinds of disorders like sensory illness, anxiety, PTSD and others. More information about best weighted blankets on familycookware. End of row 2 it’s 10 dc,ch2,sk2,dc,ch2 turn...but beginning of row 3 is ch 2, sk2, dc,ch2,sk2.... help????? On row 1A I guess you could call it - and my spaces are lining up with row 1 when from the pictures it looks like they should be already zigging or zagging. Can anyone assist with this?! Thanks! I'm a homeschooling mother of three who enjoys crafting and blogging about my crafts in my spare time.